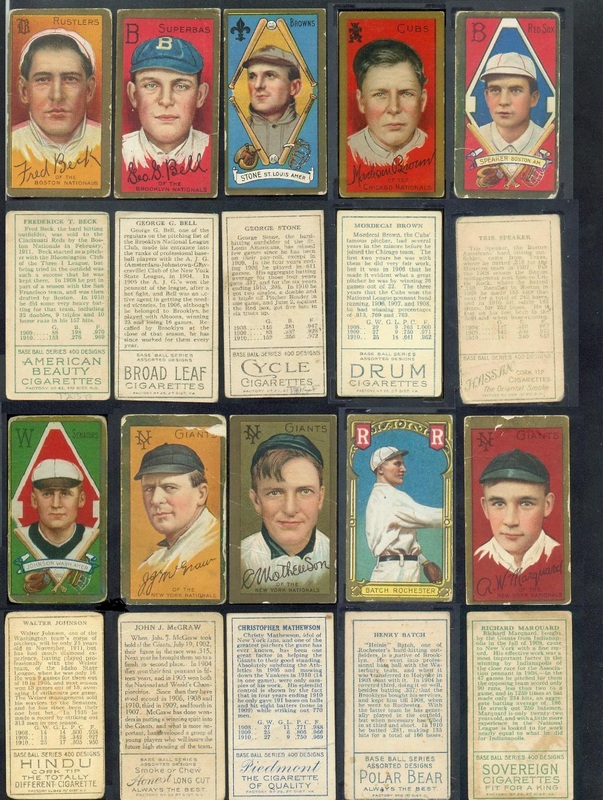 Does anyone have a high res scan of a BROADLEAF back with both green and back variations for the T205 set? Can one player have both colors? Is the green back obviously green or does it look like a faded black? Thanks for the help. I guess I don't have a black one to post side by side of the green anymore, but the green is an olive green and fairly discernable from the black. In fact it appears to be the same green as the Hassan back and there may or may not be a player correlation between the two. As to the second question, I don't know for certain but I suspect each player will only be found with one or the other and not both. It's also hard for me to see the color differences from the scans. It's easier to see in hand and with glasses and bright light. According to the T205 Resource site (as of 2013, as the site is no longer available), Austin, Downey and Phelps were the only ones identified as having both Green and Black Broadleaf backs. It is possible of course that other players may have both Broadleaf backs as well...previously unknown backs I imagine are still being discovered. I never really distinguished between them for my backs but I wasn't a master back collector when I did it. These are from the first collection. I am very confident there are 32 different Broadleafs. All players are either green or black but it can be challenging to distinguish the difference in the color, especially when the card is worn. Cory, are you saying every bl back is found with both colors? Here's a better scan showing one blueish grey and one green...I'm asking because I have a few t205 back runs going. I am just the guy typing the names (from their late 2012 listing). Quite possibly more have been identified/verified since then...newsflash update. Becker added to Green back list right now! I did none of the research. I can verify the Wheat with black back. Heck, everyone can verify it, as it is pictured in this thread, thanks to me. I have some value beyond typing skills. Thanks for the list Brian. I wish they still had that T205 website or one like it. I have a green Becker, which would be an addition to the green list if I am reading it correctly. They have Becker in black already. With the addition of the Becker to the known green back list, the lists in my previous post have a total of 31 cards (24 known with black backs, 7 known with Green). Cory mentioned 32 cards. Perhaps he knows of a known Broadleaf card not shown on the list? Last edited by brianp-beme; 04-13-2019 at 02:12 PM. I wonder if all 32 could potentially be found with green or black ink. Does anyone have a BL Knight?